You can register your team online or by mail, using our printable form. Remember there are only 50 spots available for each division. We recommend registering early to avoid missing out and getting a chance to win our early entry giveaway. $500 for 50%- other 50% is auctioned off. Posted on March 1, 2016 by Chris Strecker and filed under 2016, Tournaments, Calcutta, Announcements. We are excited to announce our Friday night Calcutta will now be called the Full Stringer Calcutta. Full Stringer Rentals have always been a great supporter of the Trio and this year they have stepped up and made a significant donation to help the tournament. If you are looking for a rental property for the tournament, they are the ones to hook you up. Thanks Jody and David Cassady! Posted on February 4, 2016 by Chris Strecker and filed under 2016, Calcutta. 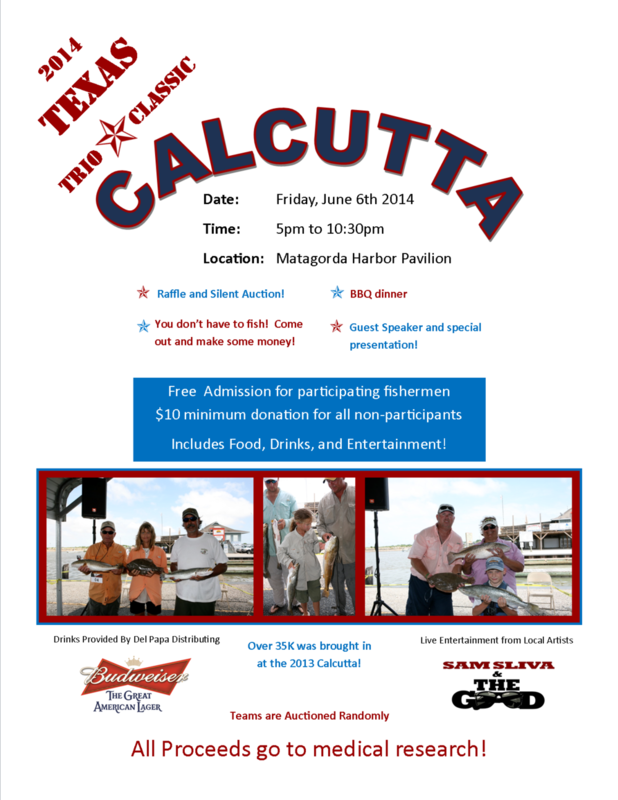 Flyers for the 2014 Kids Fishing clinic and Calcutta are now available for download. Posted on May 3, 2014 by Chris Strecker and filed under 2014, Calcutta, Announcements. Posted on May 10, 2013 by Administrator and filed under 2013, Calcutta.